Einstein's theory of relativity deals with Newtonian physics when energies or velocities are near the speed of light. Relativity is usually thought of as modern physics since it was developed at the start of the 20th century and could only be tested in the realm available to scientists by high technology. However, relativity primarily completes the revolution that Newton started and is also highly deterministic as is much of classical physics. In the holistic viewpoint of relativity theory, concepts such as length, mass and time take on a much more nebulous aspect than they do in the apparently rigid reality of our everyday world. However, what relativity takes away with one hand, it gives back in the form of new and truly fundamental constants and concepts. The theory of relativity is traditionally broken into two parts, special and general relativity. Special relativity provides a framework for translating physical events and laws into forms appropriate for any inertial frame of reference. General relativity addresses the problem of accelerated motion and gravity. By the late 1800's, it was becoming obvious that there were some serious problems for Newtonian physics concerning the need for absolute space and time when referring to events or interactions (frames of reference). In particular, the newly formulated theory of electromagnetic waves required that light propagation occur in a medium. In a Newtonian Universe, there should be no difference in space or time regardless of where you are or how fast you are moving. In all places, a meter is a meter and a second is a second. And you should be able to travel as fast as you want, with enough acceleration. In the 1890's, two physicists (Michelson and Morley) were attempting to measure the Earth's velocity around the Sun with respect to Newtonian Absolute space and time. This would also test how light waves propagated since all waves must move through a medium. For light, this medium was called the aether. The results of the Michelson-Morley experiment was that the velocity of light was constant regardless of how the experiment was tilted with respect to the Earth's motion. This implied that there was no aether and, thus, no absolute space. Thus, objects, or coordinate systems, moving with constant velocity (called inertial frames) were relative only to themselves. In Newtonian mechanics, quantities such as speed and distance may be transformed from one frame of reference to another, provided that the frames are in uniform motion (i.e. not accelerating). This eliminates the paradox with respect to Newtonian physics and electromagnetism of what does a light ray `look like' when the observer is moving at the speed of light. The solution is that only massless photons can move at the speed of light, and that matter must remain below the speed of light regardless of how much acceleration is applied. In special relativity, there is a natural upper limit to velocity, the speed of light. And the speed of light the same in all directions with respect to any frame. A surprising result to the speed of light limit is that clocks can run at different rates, simply when they are traveling a different velocities. This means that time (and space) vary for frames of reference moving at different velocities with respect to each other. The change in time is called time dilation, where frames moving near the speed of light have slow clocks. Likewise, space is shorten in in high velocity frames, which is called Lorentz contraction. Time dilation leads to the famous Twins Paradox, which is not a paradox but rather a simple fact of special relativity. Since clocks run slower in frames of reference at high velocity, then one can imagine a scenario were twins age at different rates when separated at birth due to a trip to the stars. It is important to note that all the predictions of special relativity, length contraction, time dilation and the twin paradox, have been confirmed by direct experiments, mostly using sub-atomic particles in high energy accelerators. The effects of relativity are dramatic, but only when speeds approach the speed of light. At normal velocities, the changes to clocks and rulers are too small to be measured. Special relativity demonstrated that there is a relationship between spatial coordinates and temporal coordinates. That we can no longer reference where without some reference to when. 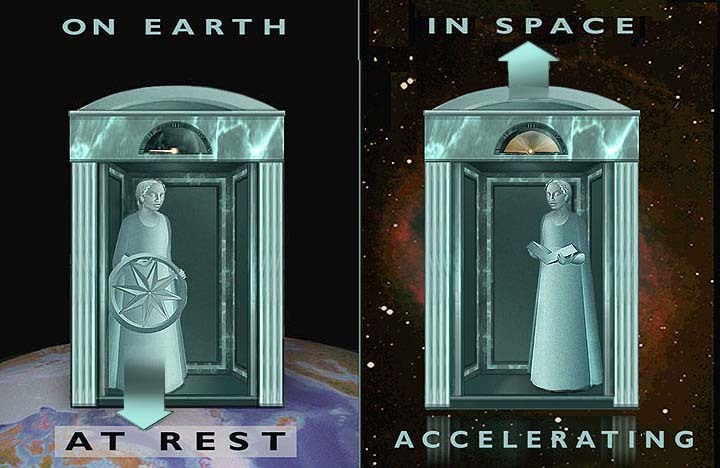 Although time remains physically distinct from space, time and the three dimensional space coordinates are so intimately bound together in their properties that it only makes sense to describe them jointly as a four dimensional continuum. Einstein introduced a new concept, that there is an inherent connection between geometry of the Universe and its temporal properties. The result is a four dimensional (three of space, one of time) continuum called spacetime which can best be demonstrated through the use of Minkowski diagrams and world lines. 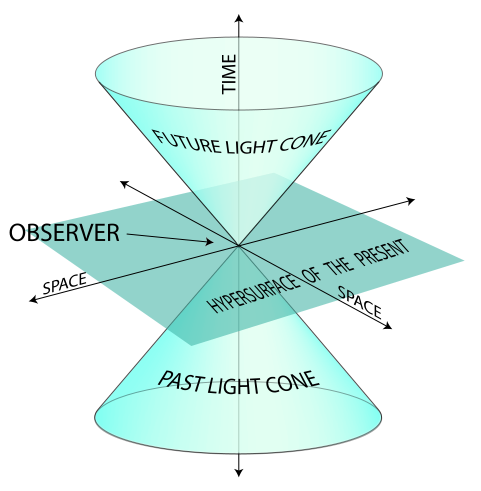 Spacetime makes sense from special relativity since it was shown that spatial coordinates (Lorentz contraction) and temporal coordinates (time dilation) vary between frames of reference. Notice that under spacetime, time does not `happen' as perceived by humans, but rather all time exists, stretched out like space in its entirety. Time is simply `there'. The ultimate result from a spacetime view for the Universe is the realization that all objects move at one 'speed', the speed of light through space and time. Consider an object with mass at rest versus an object with zero mass (a photon). The object with mass moves through time, but not space (it is at rest). This 'motion' through spacetime is all time, no space. If you move an object from rest, then special relativity states that its clock slows down. In other words, it has given up some of its time 'velocity' to move through space. The sum of spatial and time velocity always equals the speed of light. You either spent this velocity all in the temporal direction (at rest) or some mixture of time and space. Likewise, a photon has no time. It uses all of its spacetime velocity in the spatial direction and has none leftover for time. There is no time for energy. Zero time has passed for a photon created at the beginning of the Universe. Since special relativity demonstrates that space and time are variable concepts, then velocity (which is space divided by time) becomes a variable as well. If velocity changes from reference frame to reference frame, then concepts that involve velocity must also be relative. One such concept is momentum, motion energy. Momentum, as defined by Newtonian, can not be conserved from frame to frame under special relativity. A new parameter had to be defined, called relativistic momentum, which is conserved, but only if the mass of the object is added to the momentum equation. The implications of this was not realized for many years. For example, the production of energy in nuclear reactions (i.e. fission and fusion) was shown to be the conversion of a small amount of atomic mass into energy. This led to the develop of nuclear power and weapons. As an object is accelerated close to the speed of light, relativistic effects begin to dominate. In particular, adding more energy to an object will not make it go faster since the speed of light is the limit. The energy has to go somewhere, so it is added to the mass of the object, as observed from the rest frame. Thus, we say that the observed mass of the object goes up with increased velocity. So a spaceship would appear to gain the mass of a city, then a planet, than a star, as its velocity increased. Likewise, the equivalence of mass and energy allowed Einstein to predict that the photon has momentum, even though its mass is zero. This allows the development of light sails and photoelectric detectors. Special relativity and E=mc2 led to the most powerful unification of physical concepts since the time of Newton. The previously separate ideas of space, time, energy and mass were linked by special relativity, although without a clear understanding of how they were linked. The how and why remained to the domain of what is called general relativity, a complete theory of gravity using the geometry of spacetime. The origin of general relativity lies in Einstein's attempt to apply special relativity in accelerated frames of reference. Remember that the conclusions of relativity were founded for inertial frames, i.e. ones that move only at a uniform velocity. Adding acceleration was a complication that took Einstein 10 years to formulate. The equivalence principle was Einstein's `Newton's apple' insight to gravitation. His thought experiment was the following, imagine two elevators, one at rest of the Earth's surface, one accelerating in space. To an observer inside the elevator (no windows) there is no physical experiment that he/she could perform to differentiate between the two scenarios. An immediate consequence of the equivalence principle is that gravity bends light. To visualize why this is true imagine a photon crossing the elevator accelerating into space. As the photon crosses the elevator, the floor is accelerated upward and the photon appears to fall downward. The same must be true in a gravitational field by the equivalence principle. The principle of equivalence renders the gravitational field fundamentally different from all other force fields encountered in nature. The new theory of gravitation, the general theory of relativity, adopts this characteristic of the gravitational field as its foundation. The second part of relativity is the theory of general relativity and lies on two empirical findings that he elevated to the status of basic postulates. The first postulate is the relativity principle: local physics is governed by the theory of special relativity. The second postulate is the equivalence principle: there is no way for an observer to distinguish locally between gravity and acceleration. Einstein discovered that there is a relationship between mass, gravity and spacetime. Mass distorts spacetime, causing it to curve. Gravity can be described as motion caused in curved spacetime . Thus, the primary result from general relativity is that gravitation is a purely geometric consequence of the properties of spacetime. Special relativity destroyed classical physics view of absolute space and time, general relativity dismantles the idea that spacetime is described by Euclidean or plane geometry. In this sense, general relativity is a field theory, relating Newton's law of gravity to the field nature of spacetime, which can be curved. Gravity in general relativity is described in terms of curved spacetime. The idea that spacetime is distorted by motion, as in special relativity, is extended to gravity by the equivalence principle. Gravity comes from matter, so the presence of matter causes distortions or warps in spacetime. Matter tells spacetime how to curve, and spacetime tells matter how to move (orbits). There were two classical test of general relativity, the first was that light should be deflected by passing close to a massive body. The first opportunity occurred during a total eclipse of the Sun in 1919. Measurements of stellar positions near the darkened solar limb proved Einstein was right. Direct confirmation of gravitational lensing was obtained by the Hubble Space Telescope last year. The second test is that general relativity predicts a time dilation in a gravitational field, so that, relative to someone outside of the field, clocks (or atomic processes) go slowly. This was confirmed with atomic clocks flying airplanes in the mid-1970's. The general theory of relativity is constructed so that its results are approximately the same as those of Newton's theories as long as the velocities of all bodies interacting with each other gravitationally are small compared with the speed of light--i.e., as long as the gravitational fields involved are weak. The latter requirement may be stated roughly in terms of the escape velocity. A gravitational field is considered strong if the escape velocity approaches the speed of light, weak if it is much smaller. All gravitational fields encountered in the solar system are weak in this sense. Notice that at low speeds and weak gravitational fields, general and special relativity reduce to Newtonian physics, i.e. everyday experience. The fact that light is bent by a gravitational field brings up the following thought experiment. Imagine adding mass to a body. As the mass increases, so does the gravitational pull and objects require more energy to reach escape velocity. When the mass is sufficiently high enough that the velocity needed to escape is greater than the speed of light we say that a black hole has been created. Another way of defining a black hole is that for a given mass, there is a radius where if all the mass is compress within this radius the curvature of spacetime becomes infinite and the object is surrounded by an event horizon. This radius called the Schwarzschild radius and varies with the mass of the object (large mass objects have large Schwarzschild radii, small mass objects have small Schwarzschild radii). The Schwarzschild radius marks the point where the event horizon forms, below this radius no light escapes. The visual image of a black hole is one of a dark spot in space with no radiation emitted. Any radiation falling on the black hole is not reflected but rather absorbed, and starlight from behind the black hole is lensed. Even though a black hole is invisible, it has properties and structure. The boundary surrounding the black hole at the Schwarzschild radius is called the event horizon, events below this limit are not observed. Since the forces of matter can not overcome the force of gravity, all the mass of a black hole compresses to infinity at the very center, called the singularity. A black hole can come in any size. Stellar mass black holes are thought to form from supernova events, and have radii of 5 km. Galactic black hole in the cores of some galaxies, millions of solar masses and the radius of a solar system, are built up over time by cannibalizing stars. 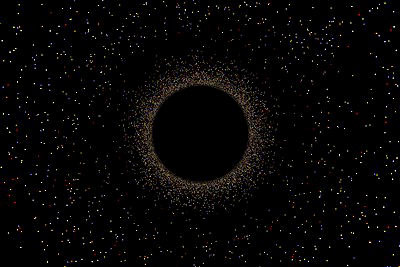 Mini black holes formed in the early Universe (due to tremendous pressures) down to masses of asteroids with radii the size of a grain of sand. Note that a black hole is the ultimate entropy sink since all information or objects that enter a black hole never return. If an observer entered a black hole to look for the missing information, he/she would be unable to communicate their findings outside the event horizon.